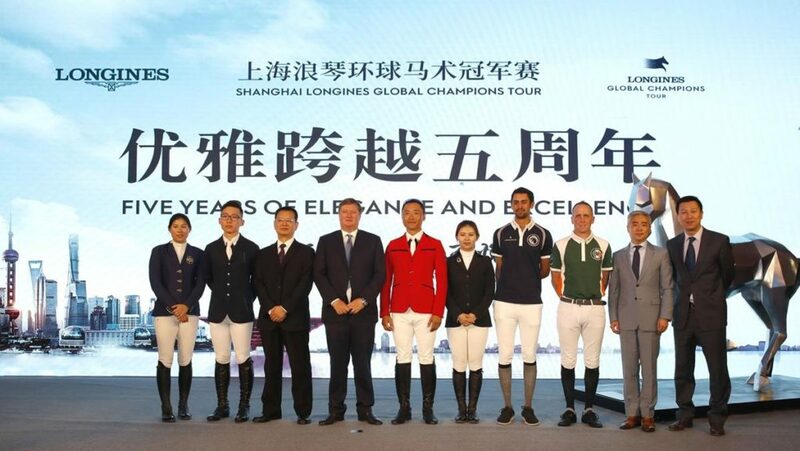 The impact of the Longines Global Champions Tour on equestrianism in China was the hot topic on the eve of the 5th edition of the event in the buzzing metropolis of Shanghai. Dignitaries and riders spoke of the excitement generated by the arrival of the ground-breaking show jumping circuit five years ago, when a historic agreement was reached with the Chinese Government to allow international sport horses into China for the first time. At a press conference ahead of the opening of the three-day event at Shanghai Pudong’s spectacular arena overlooked by the imposing red China Art Palace, new improvements to the high quality facilities were announced as spectator numbers increase each year. With 98 top show jumping horses and 54 riders the world class event is expected to attract a new record crowd to the spectacular show ground. Equestrian clubs are increasing around China with aspirational middle class families embracing the sport of show jumping with more young riders signing up. Jan Tops, President LGCT and Co-Founder GCL, said: “I want to thank our partner Juss Event and the City of Shanghai for organising such a wonderful event for the 5th year. I know how they have been in the last week with the Formula One and now hosting us at this wonderful venue. “I know we have different horse power than F1 but with the horse power we bring you are going to see absolutely top sport this weekend. It is already our 5th anniversary here in Shanghai and it has been incredible what has been achieved. First of all we were the first to get horses over from Europe thanks to the Government and all the people involved. That was a real change of connection with China and for us it is very important to have this wonderful event here. It is one of the best organised events of the 17 this year. Mr Yang announced further improvements to the stunning facilities at the Shanghai LGCT show ground to increase the enjoyment for the thousands of spectators attending the event, including extra covered grandstands for the growing numbers of visitors and this year the beautiful European village will have a French lifestyle theme. International riders joined Chinese riders Zhang Xing Jia, Arena Leung, Wang Yun Jing and Yuan Maodong at the press conference as the country focuses energy on training and developing its future equestrian athletes.